Don't worry if this character isn't familiar to you. His face isn't likely to ring any bells with even the most die-hard fans of the original Battlestar Galactica TV series from 1978 either! When Glen A. Larson's short-lived sci-fi show was launched as a somewhat blatant attempt to rival the small screen success of Star Trek, and in the clear hope of cashing in on the cinematic box office success of Star Wars the previous year, Mattel won the license to produce the tie-in action figure merchandising. 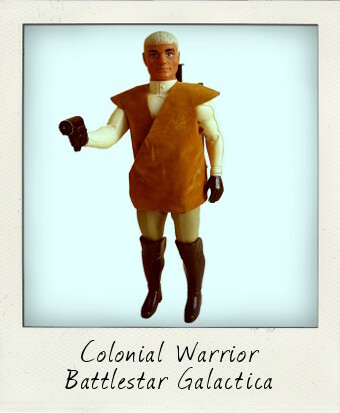 Whilst their 3 ¾ inch figures offered up recognisable characters from the show such as Lieutenant Starbuck and Commander Adama, their 12 inch hero was this chap, a generic “Colonial Warrior” who had never appeared in the show. He could, instead, easily pass himself off as peroxide-blond astronaut Commander Ed Straker (as played by the late Ed Bishop) in the cult 1970 British show UFO! Made of hard, hollow plastic, and with limited articulation – seven points at the head, shoulders, hips and knees - if anything, this figure feels even more vintage than he actually is. 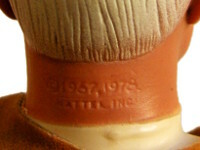 In fact, a quick look at the copyright information on the back of his neck reveals that this model was indeed first registered in 1967. 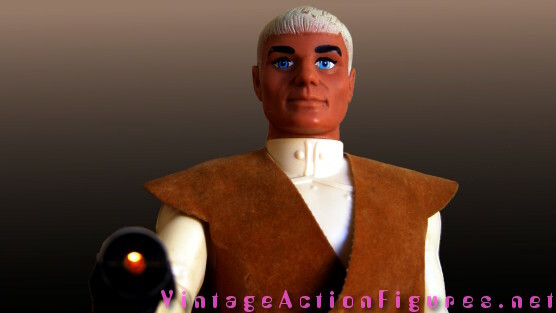 It turns out that this Battlestar Galactica action figure is none other than a repainted version of another much loved vintage Mattel favourite - Captain Lazer from the Major Matt Mason line! The passage of time has been kind to our Colonial Warrior, however, and he has now acquired a certain retro-cool, whilst he probably just looked old fashioned to kids when he was released in 1979. His backpack accessory is bolted on, but the walkie-talkie (which clips on to the side) often goes astray with this figure – luckily my loose Colonial Warrior still has his. 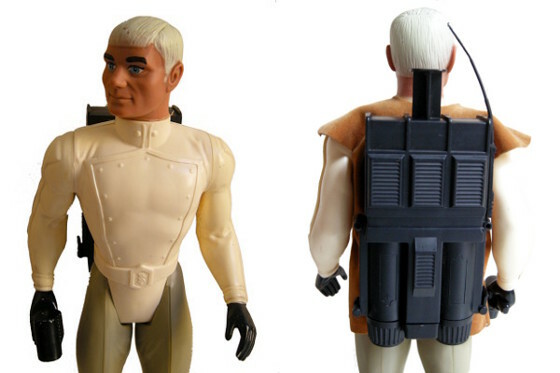 The backpack will hold two AA batteries, which allow his laser gun to light up when you plunge the button on the top of the backpack down. This is a cool effect – even better if you have the clear plastic laser accessory which plugs into the end of the gun, or the extra “scanning” device which also fits over the gun – both of which my figure has sadly lost. The tan-coloured velvet jerkin is removable, yet it is still possible to find loose figures with clothing intact – either kids preferred him with this fashion accessory intact, or they simply never played with him at all! This figure may not have sold well in its day, with kids preferring Cylon Warrior, the other 12 inch figure in the line who had at least appeared in the show, but he's still a fun item for any vintage sci-fi action figure collection and a great find! I love him!